You probably know that it is difficult to keep a dog in the house. Every dog has his character and habits and sometimes bad habits should be broken over time. It is extremely tough to deal with stubborn dogs, but if you do not break their bad habits at an early age, it will become more difficult to keep a dog in the house in the future. How can you break your dog's bad habits? Most dogs love chewing. They chew everything that they find on the ground or in the house. This habit can be dangerous for both you and your doggy. You will need close supervision and a lot of patience. 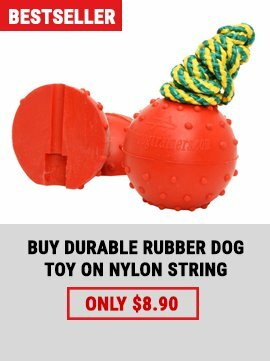 First of all, you will need to buy something that will substitute for things your dog chews. For instance, you can buy toys, balls or tugs. Such things are suitable for chewing. When you let him out, show him his toys and watch his actions carefully. You should do this each time he starts chewing something that is not his. With time you'll manage to break this habit. Sometimes barking can also be a bad habit. There are many reasons a dog may bark. Sometimes a dog barks because he wants to tell you something that he thinks is important. Other times he will only try to get your attention. The important thing is that he should stop when you want him to stop. If you need to make your dog stop barking, you will need a bottle filled with water. If your dog proceeds with barking spray the water on him. He will not like your actions and will stop barking. You can also try to clap your hands in order to get his attention. These actions are not cruel. 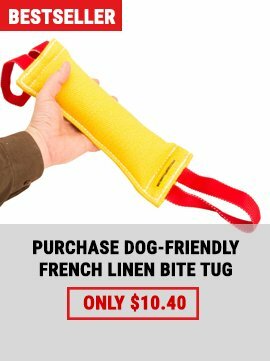 It will only help you break your dog's barking habit. We know how difficult it may be to train a dog. 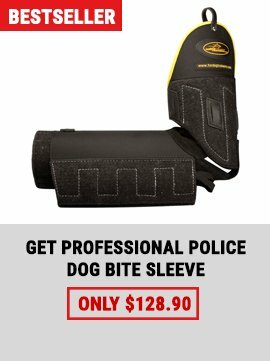 That's why we want to invite you to our store where you can find bite sleeves, suits and balls for obedience training. We guarantee that our equipment is very strong and will serve you for many years. Order training tools from our store. Professional trainers have approved our items. Now its your time to choose.